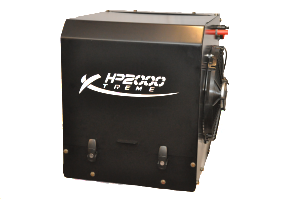 Periodically we are asked what makes an auxiliary power unit worth the added initial cost over using a portable generator to run the a/c or to provide power to accessories in your truck while you are parked. I stress initial because it doesn’t take long for a quality APU to pay for itself while keeping you comfortable. As most of you know, many states have now passed anti idling legislation that can result in fines up to $25,000 and even one year imprisonment in some states. This means that if you are parked in 5 degree weather or 105 degree weather, you may not be able to idle your truck to keep warm or cool. In order to keep your cab comfortable and ensure you get a good night’s rest, you need an auxiliary power source for your truck. Auxiliary power units built specifically for trucks not only provide the power you need to stay warm or cool, they also offer a host of benefits including keeping your batteries charged so you aren’t left sitting when you should be driving. Does the Potential Savings Outweigh Lost Features? Generators, while having a lower initial price tag, are missing several features that will detract from your comfort and in the long run could end up costing your more money. Imagine how much money you would lose waking up to dead batteries and missing your delivery window! The first issue that you will have with a generator is that the majority of them have gas engines. This means that you will have to carry enough fuel cans to run your generator and every time you stop for fuel, you will have to fill gas cans, if you forget, you will be without heat or air. and grime into these heads, rapidly wearing out the brushes. Our APU was designed to provide power for your 110V appliances through an inverter, eliminating that common failure point. Generators may not last as long, but they are cheaper right? While the price of a decent generator is less than the starting price of an APU, when you consider the add ons you will need to make it function efficiently, your savings aren’t as considerable and you are still missing out of several features designed to make you more comfortable on the road. you want to start the generator, you choose one with a remote start option. A unit like the Honda EU3000iS has an MSRP of around $2,400 and can only power a 13,500 BTU a/c unit, 6,500 BTU less than our APU. Since you don’t want to mess with filling fuel gas cans at every stop, you decide to buy a diesel generator with remote start. The price tag for a good unit such as the Cummins Onan QD 3.2 Diesel RV Generator – 3.2HDZAA-6508 is just under $5,500 and you still don’t have a control unit that auto starts the generator when your batteries are low. It also does not pre-heat the engine on a certain day and time to make sure your rig is ready when you are. Not to mention you are still going to need a battery charger that can keep up with your engine heating pads, bringing the cost very close to that of our APU. Aside from the initial cost of purchasing a unit, our APU is going to save you time and money over its’ lifetime. Our unit can be fully serviced in around 30 minutes whereas a generator must be completely removed to be serviced as the oil typically is drained from the bottom and most units must be strapped to the catwalk. The actual servicing of the unit doesn’t take long for a generator either but the smaller engine will most likely require more frequent maintenance, meaning down time for your truck and the more separate components you have, the greater the likelihood of failure. One night of sleeping in 5 degree weather and you will be wishing you chose an APU instead of trying to save a few bucks upfront on a generator! As an over the road driver, you need professional grade equipment that you can rely on. While a short haul trucker may be able to skimp on their equipment, your livelihood depends on being rested, charged, and ready to roll at a moment’s notice. The HP2000 Xtreme will do its’ part to make sure you are ready when duty calls.